If this winter scene doesn't speak to you of wonderful soft silence, long hours of cozy sleep, and special family times, you're probably one of the people who ought to stay home! This tranquil scene was found among the lodgepole pine forest at 5700 feet near Swampy Lakes Sno-Park and Mt. 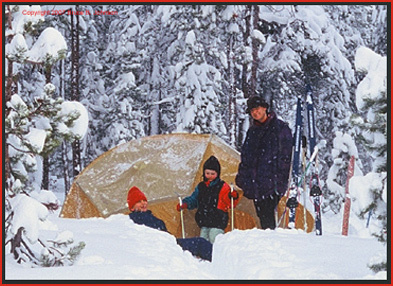 Bachelor, Oregon.... Nearly two feet of snow had fallen overnight, a snow camper's dream for us in our bombproof geodesic dome tent! But for others not so well equipped, well, since it was a very heavy snow, and sticky, it was a real nightmare for our neighbors, who were not protected by an expeditionary-class tent capable of withstanding the cement-like snow-loading.....Why are our skiis and poles standing upright near the tent door? It's a snow-camping tradition, but not merely a dumb tradition. A night with two feet of snowfall shows the wisdom of the practice (hint-- it took us over an hour of unpleasant digging in the snow to find our cooking pots). 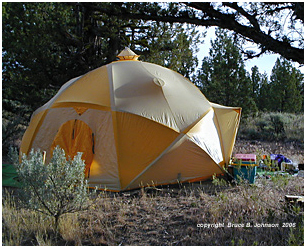 The tent in the image above is a TNF (North Face) "North Star," a 4-man geodesic dome. It was a very expensive, limited production model first introduced in 1979....Part of its fame is that it was the tent which famous North Polar explorer Wil Steger used. 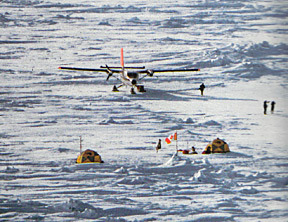 (Will Steger).. A National Geographic article which covered his circa 1985 expedition to the North Pole showed "North Star" tents in use under very harsh polar ice-field conditions (picture below showing two North Star Tents near the Pole is taken from National Geographic Magazine in September of 1986, page 314, Vol. 170 no. 3)..... The North Star tent was phased out and replaced by a slightly larger geodesic dome named the "Himalayan Hotel" in the early 1980s. Will Steger seems to have had a gear connection not only with The North Face, but also with pioneering radical gearmaker Jack Stephenson of Warmlite ....... I have in my possession a Jack Stephenson original Kodachrome slide showing a Stephenson tent under winter condtions, and a person beside it wearing one of Warmlite's 800 fill power ultralight down parkas; the handwritting on the mount says, "Parka on loan to Wil Steger," and the date on the slide mount is February 1977.... I also have a note from Jack Stephenson himself that states Wil ordered Warmlite vapor barrier sleeping bag inserts after his bad experiences with the Quallofil sleeping bags used on his North Pole trip-- the bags had become so full of frozen accumulated water vapor that they weighed 35 lbs. apiece by trip's end, and had lost most of their insulative value. So Wil slept a lot warmer during his next expedition, which went to Antarctica to achieve the first-ever traverse of the Antarctic continent on foot in 1990 (The Trans-Antarctica Expedition).. . also of interest is that on a different expedition, Wil also experimented with the very innovative sleeping bags put out by a small custom gearmaker in Oregon called Downhome (click for more). Downhome was one of the few other bag-makers who offered vapor barrier technology. This clipping was provided to me by Jack Stephenson; that's his handwriting on it labelling the tent as his Model 3R.... 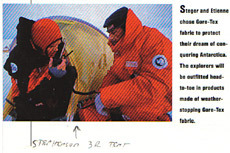 It's a magazine ad for Gore-tex fabric, and its stars Wil Steger and his partner Etienne wearing lots of Goretex in Antarctica, but the delightful irony in the picture is that the tent in the background is one of Stephenson's iconoclastic tents, which are engineered with vapor management principles running totally opposite to the basic concepts of Gore-tex! (Wil Steger is on the left)....This link to my own pages about Stephenson's Warmlite will be of great interest to you... Also, you may go to Warmlite's own website for a thorough discussion of the principles behind these wonderful tents. Below are two final pictures of the NorthStar tent-- the first is of the tent in use under expeditionary conditions high on the glaciers of British Columbia's highest mountain, Mt. Waddington (just under 14,000 ft. high). 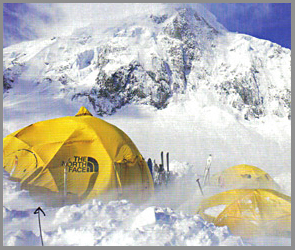 The black arrow on the bottom left points to the tent.....This picture was found on page 64 in a climbing magazine called "Snoworld." (I have marked "10/2001" on the clipping, but this may be years after the picture was taken). This second image is of my own NorthStar during a Springtime trip to the Oregon High Desert.